Yes the ears are legit. Yes I planned it that way on the last strip. Eventually the cast page and chart will get updated. Go listen to the They Might Be Giants Cover. Good stuff. if you have to reply to your comment to comment that it was the first comment, is it still the first comment? It just means that i got the first two comments instead of the first one comment! Considering the grin, Cheshire. The cat-guy hasn’t been that concerned about himself dying due to probability, so not Schrodinger. And I’m liking this guy more and more. He’s just, so cheeky. Well, you WERE very sneaky about it. The ears are real!? Yay! Also, love They Might Be Giants. Have since I heard the theme of Malcolm in the Middle. 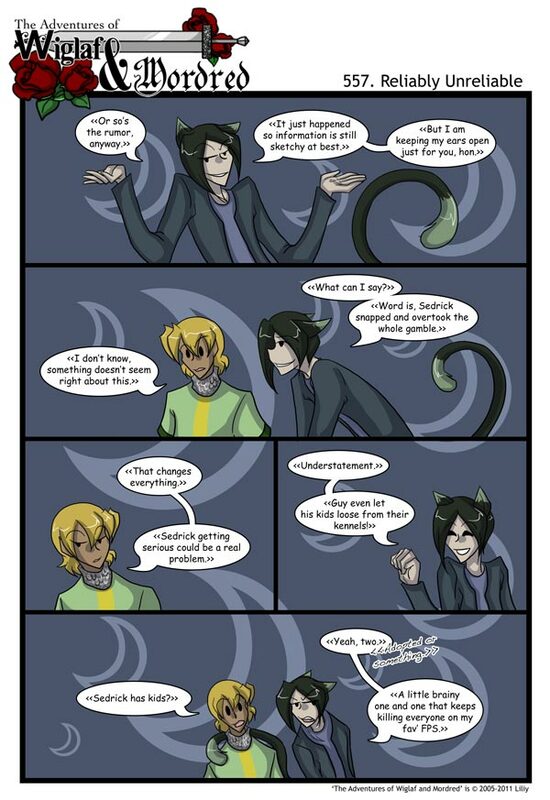 AHAHAHAHAHA random Catboy PWNS!!!! XD it’s so..random!! I love it!!! And I JUST noticed a really cute REALLY tiny lil smiley face at the bottom left corner of the screen! how long has that been stalking us?!? Holy crap that smiley face. I just stared at the bottom left of the screen for a full minute before I saw it. Wow. That. How long HAS that been there? It’s from the WordPress Stats Plugin. XD So it’s basically always been there. Oh dude, there is one. Liliy, is the tail prehensile? It seems prehensile. If it’s a cat-person, then no, no it wouldn’t be. and lack of updates on the cast, we still love you liliy. Especially the fangirls. Liliy, if you are low on available time then do what every other Chief Executive does DELEGATE DELEGATE DELEGATE DELEGATE and DELEGATE. I bet there are plenty willing and able to put together a revised relationship chart based on known information up to this date. The same can be said about the mini-biographies for each of the new characters as they pop up. Just ask your fans to help out. I’m sure there are lots of us who are more than willing to help you organize your relationship chart and/or write the character’s mini-bio’s. You can always add in your own little notes later. -pats on the shoulder- No one can mimic the epic that is WAM. I’m sorry, but it’s true. Actually, I prefer the Taco version — although the Gene Wilder/Peter Boyle version from “Young Frankenstein” makes me smile too. Loving the fact that we have a catboy. And somehow… my ears perk up when I learn Hildeburgh has murder superiority on and offline. …The relationship chart got updated! Even Herschell is on it. Eh, probabbly against popular opinion, but I think the cat-man is a little off the wall. Even the W&M wall.